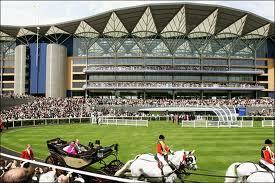 Royal Ascot is the best, and most challenging, flat race meeting in the World. Spread over five days and thirty races, Royal Ascot is a banquet of quality racing, with 70% of the action non-handicap. It's like The Crystal Maze with Clare Balding in place of Richard O'Brien. As I mentioned last week, the average win odds of 12.68/1 and average field size of 21.6 mean that finding winners in Royal Ascot handicaps is a very difficult test. My own track record in such races in recent years has been lamentable, with form book misreads, draw misreads, and going misreads conspiring to publicly humiliate me from this virtual lectern. 40 of the 45 Royal Ascot handicaps since 2008 have been won by three- to five-year-olds. That works out at 89% of the winners from 78% of the runners. 31 of the 45 Royal Ascot handicaps since 2008 have been won by horses priced 12/1 or shorter. That works out at 69% of the winners from 28% of the runners. 28 of the 45 Royal Ascot handicaps since 2008 have been won by horses aged three to five, and priced at 12/1 or shorter. That works out at 62% of the winners from 24% of the runners. Following that last line will put you within 3% of parity overall at starting price, and in front to Betfair SP. That's a phenomenal result when set next to my own Royal Ascot handicap performance. It's small 'action' bets only in these nine races for me. We all like to read about Royal Ascot. It's part of the anticipation; it builds the excitement; it gives us some starting points from which to pick at the puzzle. But statements like "He's been laid out for this" are hardly helpful at a meeting when 99.999999% of runners (possible minor exaggeration) have been laid out for it. The form book is your friend above all others this week. Use the form (book), Luke. Or Jim. Or Jane. Or Jeff. If that sounds too much like hard work, then let's make life simpler. 116 of the 150 Royal Ascot winners in the past five years finished 'on the podium' last time out. That's 77% of them from 59% of the runners. If studying form is too hard, then why not let others do it for you? The standout best general judge of form is 'the market'. Using our 12/1 cutoff again gives us 120 of the 150 winners (80%) from just 867 runners (36%). Alas, the price ceiling also precludes the prospect of profit. However, combining primitive form barometers like the above (i.e. 1-2-3 last time out, 12/1 or shorter) with an age threshold of five, and a race distance of two miles or less (most the older horse winners prevailed, unsurprisingly, in the long distance races) gives us 85 (57%) winners from 575 (24%) runners. All well and good, but none of this is profitable, though it will limit losses. So how about this as the ultimate 'quick and dirty' fix? Backing favourites including joint- and co-jollies) in the last five years would have seen a return in 52 of 150 races (35%) and would have netted a profit of 21.01 units at SP. Before you rush excitedly to withdrawn your life savings to play favourites, let me tell you that over the last ten years, four were losers, a couple unpleasantly so. In a way, that's heartening. After all, what use is a brilliantly absorbing puzzle if the answer is on the bottom of the box? I've already talked about horses being 'lined up' for Royal Ascot, and the folly of buying into that. So it might be strange for me to then mention that I'm staying on the right side of a trainer who lines horses up for the Royal meeting. Well, yes and no. The key here is that not all trainers are equally adroit at 'lining one up'. Johnny G leads his field at this meeting, by some distance. In the last five years, Gosden has saddled 74 runners and garnered ten winners from that output. Those winners were good enough to about break even. Materially perhaps, given the parameters we've already discussed, all winners were aged four or younger, and all were 12/1 or shorter. Back John Gosden runners aged four or younger and priced at 12/1 or less. That would have netted the ten winners from just 39 runners, a strike rate of 25.64%, for a profit of 32.58 at SP. The place strike rate of 51.28% will be of interest to each way punters, with 41.95 units of profit, albeit from twice the stakes (win/place). A degree of caution should be counselled on the basis that JG had a stellar year last year, which is almost certainly unrepeatable. However, he's notched at least one win every year since 2004, and has only two losing years since 2006. Different people have different views on the merit of placepot and other tote pools. They allude to take outs, and the like, but conveniently ignore the fact that in a multi-race bet, the take out is divided by the number of legs (see Crist's Exotic Betting). As important is that they carelessly (in my opinion) overlook the gross inefficiencies of the tote pool as opposed to the starting price or Betfair markets. Basically, there's a lot more 'mug money' in tote pools, especially at the big meetings! The placepot pools this week will be huge. Last year on Gold Cup day (Thursday), the placepot pool was £533,513.84. It was within £1,000 of that figure on the Saturday too. On Tuesday, players will be competing for a share of half a million or so before deductions, and it's historically the easiest day. Whilst last year was tricky, even with the presence of 1/10 Frankel in the first race (ostensibly making it a five leg bet), in 2011, the dividend paid £40.20 for four favourites (including 3/10 and 5/4), a second favourite and a third favourite. A similarly straightforward 'pot in 2010 paid an incredible £251 from a pool of £400,000. It usually gets harder as the week goes on, and my own permutations expand accordingly. But Tuesday is a day for a tight perm to squeeze some value from the pools. I've been guilty of getting carried away with Royal Ascot in the past. In fact, I've done my brains the last couple of years, due to bad discipline, bad picking and a lack of a game plan. That's a pretty dreadful cocktail of ineptitude and, even if results go against me again this year, at the very least I will have limited losses with better discipline and a better strategy. It's important to remember, in the teeth of a howling wind of adversity (which can blow in on punters on even the most clement of Royal Ascot days), that this game should be fun. Sure, we're trying to beat the bookie. Yes, we're trying to solve the puzzle. But if, at the end of it all, we look back and think, "I didn't really enjoy that", then what is the point? We might as well get another job as fail to enjoy our betting exploits. We punt for the thrill; for the game; for the profit. Take the first two out and you're left with a business transaction, devoid of character and humour. Yuk. No thanks. And that's my five rules for the week. If I'm able to adhere to them, even most of the time, I shouldn't go too far wrong. I'll definitely enjoy the meeting without worrying about the financial crater into which my errant wagers have historically detonated. And, whisper it, I might even turn a profit. p.s. what's your golden rule for betting at Royal Ascot, or indeed generally? Leave a comment below, and help us all become better bettors! Nice post Matt, and some interesting stats to go to war with. I think it pays to keep in mind the historical trends at any big meeting, but at the same time to not be completely led by them. I also think it is best to limit your bets – it is too easy to have a bet on every race. To keep an interest and to keep it fun I’ll probably have a few small stakes multiples over the course of the week. That way I’ll be less inclined to do my dough on races I shouldn’t be betting in, yet will still have a small chance of a nice payout should a few of my less confident bets come in. While I understand the thinking behind avoiding the handicaps I’ll probably concentrate more on them as one or two big-priced winners could make for a profitable week. Yes, it was cleared down ready for the start of the Royal Ascot competition tomorrow. We do have the data backed up, but the competition ‘proper’ will start tomorrow for Royal Ascot, and then we’ll have a short hiatus until the start of July, when the monthly competitions will begin. Sorry, I don’t currently have an easy way of communicating that, only to Tipping League players. You mean I haven’t got a chance of winning the trial now ? I suppose I’ll have to put up with being second!! looking forward to the tipping league challenge. I always advise people at any meeting…take what you can afford to lose, and budget sensibly. You might even make a profit, or at least not lose too much! Self-discipline is required. Hi Matt, my golden rule of betting which i think may be even more importent at big meetings involves each way betting. like every good each way bet It will come fourth. only back a horse each way because you are convinced its going to win and the only thing that will stop it winning is an act of god. If you don’t think a horse can win, why are you backing it. I you think 3 or 4 horses will win, back 3 or 4 horses to win. I have been known to back horses as low as 2/1 each way. that may sound strange to some but it can work. so my golden rule is , an each way bet is simply an act of god insurance policy. If you ask my two boys (aged 21 and 19) the question, “What are the two key tenets to a successful life?”, they will always respond “1. Treat people they way that you would like to be treated yourself………………2. Only bet what you can afford to lose!!!! I have found these are pretty much the only things you need to adhere to for a successful, fulfilling and enjoyable life!!! GREAT INSIGHT PNCE AGAIN MATT …… HERE’S ONE OF MY TRUSTED ANGLES ……. FOLLLOW WITH GREAT INTEREST ANY THING RUNNING BY THE SIRE ” DUBAWI” HE HAS A SUPERB RECORD FOR HIS PROGENY AT ASCOT . 49 years ago to celebrate my 21st birthday I was taken to Ascot in a limmo and given a top seat in Ladboke’s enclosure. I had the first four winners and was up 3months salary when, drunk with success, I put it ALL on a 1-3 ‘unbeatable’ favourite trained by Vincent O’Brien and ridden by Lester Pigott. Pigott almost pulled the horses head off to stop it winning. EVERYONE in the enclosure around me stood up to boo Pigott. Why he did so and how he got away with it I will never know, but it taught me to never again put all my eggs in one basket. My rule is don’t treat RA any differently to any other meet. Stick with your selection process(es) and staking plan and grind on. There are 4 other meetings to find good bets at too on Tuesday.